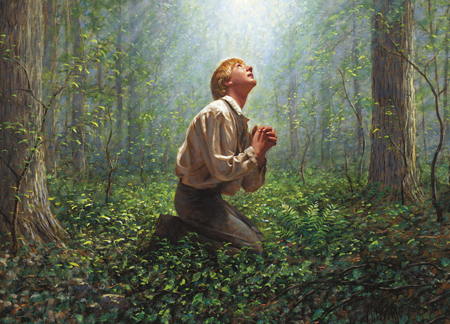 Addendum: There are several (at least 4) different recorded accounts of the first vision given by Joseph Smith, which contain some contradictory information. Although the first vision occurred in 1820, the first recitation of the vision was not documented until 12 years later in 1832 , and subsequent version were recorded in 1835 , 1838 (most common) , and 1842. The personages appearing to Joseph in these encounters are different and the significance of this is debated. In 1832, Joseph reported that two unidentified personages appeared sequential (and not simultaneously) to him, that the second verbally referenced Jesus Christ, and that he thereafter saw many angels during the vision. In 1835, Joseph recorded that “the Lord” appeared to him without mention of the Father. The 1838 account is the one most commonly known and taught, and the 1842 account records the appearance of two personages of exact likeness. Meaning: From a secular perspective the discrepancies of accounts as well the prolonged time between when the vision occurred and when the vision was reported are problematic and suggest that the vision may have been changed over time and that is certainly less important (and perhaps unknown) in the early church than it currently taught. From a faithful perspective, the discrepancies may be explained by the difficulty of retelling a story so many years later. While acknowledging that historical discrepancies exist, the later emphasis of subsequent church leaders on the 1838 rendition highlights attention on the significance the Church wants members to place on God the Father and Jesus Christ as two separate personages. 1-The Joseph Smith Papers. http://josephsmithpapers.org/paperSummary/history-circa-summer-1832?p=1. Accessed 7/3/14. 2-The Joseph Smith Papers. http://josephsmithpapers.org/paperSummary/journal-1835-1836?p=24. Accessed 7/3/14. 3-The Joseph Smith Papers. http://josephsmithpapers.org/paperSummary/history-circa-june-1839-circa-1841-draft-2?p=2. Accessed 7/3/14. 4-The Joseph Smith Papers. http://josephsmithpapers.org/paperSummary/church-history-1-march-1842?p=1. Accessed 7/3/14. This entry was posted in First Vision Accounts and tagged Joseph Fielding Smith, Joseph Fielding Smith Chapter 1, Melchizedek Priesthood, Relief Society, Teachings of the Presidents of the Church on July 4, 2014 by claytonbhess.